Quantum-Touch® is a method of energetic healing that works with the Life Force Energy of the body to promote optimal wellness. Level 1 focuses on tactile, hands on healing also providing an introduction to distant healing. Level 2 focuses mainly on distant healing. Learn more about Quantum-Touch by visiting the QT website. Registration: Call or e-mail the instructor to register or if you have any Quantum-Touch questions. Quantum-Touch Level 2 Payment Policies: Payment or a deposit is required at the time of registration to secure a space in the class. Students are registered on a first-come, first-served basis. The Quantum-Touch organization does not save or reserve unpaid spots. Methods of payment: Credit Card (Visa, MasterCard, or Discover). Discount Policy: For students repeating Quantum-Touch Level II, QT is offering a 50% discount for classes instructed by Carol Lee. Students 18 and under also receive a 50% discount. 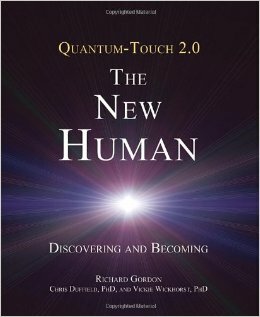 Order your Quantum-Touch Level 2 book, “The New Human”. The National Certification Board approves “Quantum-Touch” for Therapeutic Massage and Bodywork (NCBTMB) as a continuing education Approved Provider (13 CE). The Live Level 1 & 2 Quantum-Touch Workshop is valued at 12 CE Units by the International Medical and Dental Hypnotherapy Association (IMDHA). If you are interested in becoming a Certified Quantum-Touch® Practitioner, now is the perfect opportunity to take advantage of the classes we have scheduled in your area. Being a Quantum-Touch® Level 1 & 2 Instructor and Mentor allows me to embrace your journey, offering you ideas about creating a successful business along with nuggets of wisdom from years of experiences. Let me help you become a Successful Certified Quantum-Touch® Practitioner, have confidence as you work in the Quantum Field with Distant Healing and grow an International Clientele. YOUR LOVE MAKES A DIFFERENCE! This is HuiFan Lee (Grace). Just want to tell you how much I appreciate your help. Couldn’t use a word to explain how much I appreciate it. Thank You for helping my family with QT distant healing. Thank you so much for the beautiful class this past weekend. I’m still flying high on all the amazing energy. You’re a fabulous teacher and this has to be the best class I’ve ever attended. What a truly incredible group of women. Thank you also for the energy you sent me Sunday morning. I’m so grateful I could finish the class. Hope you had/have a safe trip home. Tell your husband hello. Thank you so much for class this past weekend. It was a profound weekend. I respect the work that you do and the way you encourage us to listen, trust and do. Thank you for your love and healing when I was having my releasing experience. It is very much appreciated. I feel changed from this weekend and am still integrating. Thank you again, I look forward to working together in the future. I had so much fun and learned so much too. Thanks for being such a great teacher. Our friend in the hospital that was unconscious had woke up yesterday towards the end of our class. I wanted to say thank you so very much for the awesome workshop this past weekend. It was my first energy class and I am so very grateful to you and to Heidi (Local Coordinator) for bringing this class to Indianapolis and to us. A few people from the class met at Penny’s (Healing Center) last night for meditation and we could not stop talking about Quantum-Touch and the experiences we had. Truly enlightening! This advanced energy medicine class is essential for all holistic practitioners, Eastern and Western medicine alike. As a metaphysician, a student of metaphysic modalities, a light worker practitioner and alternative medicine researcher, this was my most profound course of study to date. For me, Quantum-Touch makes this work fun, simple and necessary for whole healthy living: mind, body and spirit. It is individual to each practitioner and recipient with a dual relationship modality that is in harmony with any belief system, all health concerns and the journey of the healing process. Carol Lee is a passionate teacher who invasively and consciously guides you through each step of the learning process. The connection she builds with each student and their own experience is amazing to engage in and witness. I feel truly blessed to have crossed paths with the Quantum-Touch program and Carol Lee. I am a renewed person, I am an improved worker, and my life has been forever changed and revitalized. Come experience the difference for yourself and for those around you! Carol Lee is a profound influence in my life. With her many and varied gifts, she has been instrumental in leading the way for me to find and follow my spiritual path. At a time when I was spiritually and physically floundering and unsure, Spirit provided me the answer in Carol. Her knowledge and skills using Quantum-Touch, along with other complimentary methodologies, has provided enlightenment, spiritual peace and an inspirational role model for me. I value and treasure my experiences with Carol and know that she was put forth to me as a ‘teacher’ when I was ready to learn. I value both her friendship and her skills. Without Carol’s influence and knowledge, I would still be at the beginning of the road seeking what I didn’t know existed!